Thanks, Kermit! I appreciate you posting it. I hadn't seen that one where she's giving such detail about the murder, and saying "Travis was bleeding everywhere, and he wouldn't die, and he was screaming, etc." I'm trying to figure out how on earth she can testify that she remembers nothing after shooting him if that interview is part of the court record that the jury heard. That interview is absolutely damning held up to her testimony in court. Great photos of the bent finger above! Could it be that the story that Jodi Arias relates to the detective regarding "intruders" is an actual account of the events encompassing the murder of Travis Alexander. However ... the killers were not "intruders". The following appears to be a full transcript of the video you posted above. 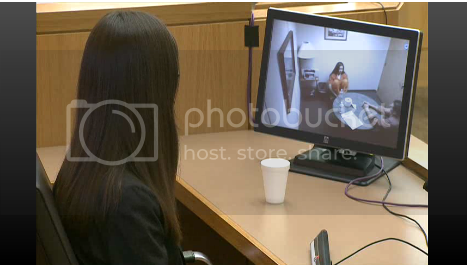 ARIAS: Travis was bleeding everywhere. The first pic in both the top and bottom row makes quite the visual comparison, doesn't it? I think the prosecution should have this blown up and on display during closing arguments! If her mouth is moving she's lying! There's just so much that prove premeditation. I start mentally creating a list and always forget something, there's so much! I heard Gloria Allred say on HLN that she had uncovered that the white car was more expensive to rent than the red one offered Jodi. For someone trying to say she got gas cans to save money, that's hard to swallow. Speaking of the gas cans....... Jodi has proven repeatedly that she lies to cover her arse, and the State has proven she lied about returning the gas can to Walmart. The only answer to the follow up question, "Why did she lie about the return?" is, once again, "To protect herself". She wanted no evidence that she was in Arizona. What a coincidence that phantom skateboarders flipped her license plates. Come on.....! She turned off her cell phone while in Arizona.........Why? She didn't want a ping to register within the State. The State has proven, through the Medical Examiner, that the murder couldn't have possible taken place the way Jodi testfied. Why lie about it? To cover herself and try to put forth a self defense argument, rather than something she planned. The gun: there is no evidence that Travis owned a gun and lots of evidence he did not. Between the coincidence of Jodi's Grandparent's "burglary" of the same caliber gun (while her laptop was left untouched) and the shelf being unable to support her weight the way she describes, that's proof of her lying about it and when she lies, she's protecting herself. Even she told police Travis didn't own a gun! She brought it with her and planned the burglary to make sure she had one. Her actions after the murder reek of cover up to protect herself and even from jail, she was writing in magazines to illicit support for her lies. this gave me a visual of what/how she killed him. Liars always give parts of the truth. gas cans and rental car and dying her hair. jury and she deserves first degree death penalty. that is what makes it so heinous imo. I wished you worked for Juan Martinez - for his final argument. Considering Jodi Arias relates a fabricated story to the Detective Flores that involves "two" intruders ... could it be she realized that the beyond brutal murder of Travis Alexander ... the crime scene ... would be questioned if she implicated only "one" intruder. In other words ... could it be that Jodi had an accomplice ... an accomplice she will throw under the bus IF the jury does not buy the "self-defence" plea. This wannabe detective suspects "IF" Jodi is convicted of premeditated murder ... the elusive Matt McCartney will be exposed as a participant. In other words ... Jodi will not take the fall alone and ... will plea bargain her way out of the death penalty in exchange for the truth. Then again ... I have been accused of suspecting conspiracies where there is none. Have a good Saturday Kermit. Have a good Saturday All. 1. Why did Jodi Arias implicate TWO intruders in the events of the fabricated story encompassing the vicious murder of Travis Alexander? Could it be that Jodi believed that a recreation of the actual events ... a recreation that would match the crime scene ... would convince Detective Flores that she was relating the truth? 2. Where is the elusive Matt McCartney? Could it be that Matt has already been apprehended but refuses to testify. In other words ... he has taken the 5th? I believe the State is missing a little opportunity in trial. It was obvious to me that the defense is going to say, in closing arguments, that Jodi could have held the support between the shelves (the vertical piece separating two rows) in the closet to lift herself up to the location of the gun, thereby lessening the weight distribution of her foot. That's not exactly what she testified to, but they'll say she was panicked and may not remember details like that. I wish the State would bring in those shelves and have Jodi climb all over them like a monkey. I have shelves like that in my office and there's no way an adult could step on one of them without them flipping. No way. However, that's just the kind of thing that can open a crack in a window for a juror. That's a window that can be nailed shut. IMO, the other thing to watch for is the defense to hammer home to the jury that if there is ANY other possible explanation to any of the pieces, then they cannot return a guilty verdict. Baez was very very good at this and it's the one area where I think the State's rebuttal at closing arguments, was lacking. The jury needs to be reminded by the State that they are not asked to leave their common sense at the door, and REASONABLE is the standard to follow. The defense being able to end on another mumbo jumbo expert is unfortunate. The defense mental health experts supply the smoke in their mirrors and pull focus away from the murder itself and Jodi's participation and planning for it. They are the "George Anthony" distraction. As I said before, there's so very much evidence of her premeditation to murder Travis and her efforts to go unnoticed and untraced while she was in the State of Arizona. I think I forgot to list her hair color change in that list, which she lied about and pictures prove otherwise. That, coupled with the hard evidence from the medical examiner that her account of what happened during the murder is virtually impossible, is so far above the minimal needed to prove premeditation. Those are the issues. The defense didn't put forth a mental health defense, they chose self defense, and that offering has been blown to "smitherines"! Very well stated. Its funny though isnt it that like the casey anthony case, 90 something percent of the general public thought she was guilty yet they managed to find 12 idiots that didnt. I hope this case is different because anything less than 1st degree validates the horrible lies told about this man this entire trial & i 100% believe they were all lies. I just today finished reading Baez's book (don't hate) and in some ways this case is very different, to me. First, CA denied she did the murder, unlike JA. We know how Travis was killed, but that was one of the points that Baez had in his favor was that he tried to get across to the jury that they did not know for sure just how Caylee died. (Remember he proposed the drowning). Don't misunderstand me, because I think both are guilty, but Baez really did confuse the jury and plant a lot of uncertainties in their mind. I think that is how he as able to get the verdict he did. I don't think this jury will let JA off - I think she will get the harshest conviction. Caddy No hate here for reading Baez's book. I agree Baez did his job well confusing the jury. But they were brainless as far as I am concerned. I see similarities between the two but mostly the ability to lie and lie and lie some more. They both think they are smarter than everyone else. I sure hope they see thru all her lies. The I was defending my self wont go over I hope. 29 knives wounds a gun shot to the head and the throat slit is not defending ones self that is just cold blooded killing. Very articulately stated and I agree 100%! The SHELVES - why in the world doesn't Juan bring in a mock up of the shelves? Instead of photos. anything now to see if it will stick because they are not confident in their case any more. I wonder, CBB - do you know what it takes to convict on premediation? Are there a specific number of things one must prove? if there was anything to Matt McCarney it would have showed itself by now. It seems to me that the jury was unbelievably ignorant of the law and the evidence & testimony. I mean there were so many obvious, obvious things about that case that the jury chose to ignore. Maybe because it was so unimaginable that a young girl had murdered her own child and went out partying. Page created in 9.563 seconds with 20 queries.